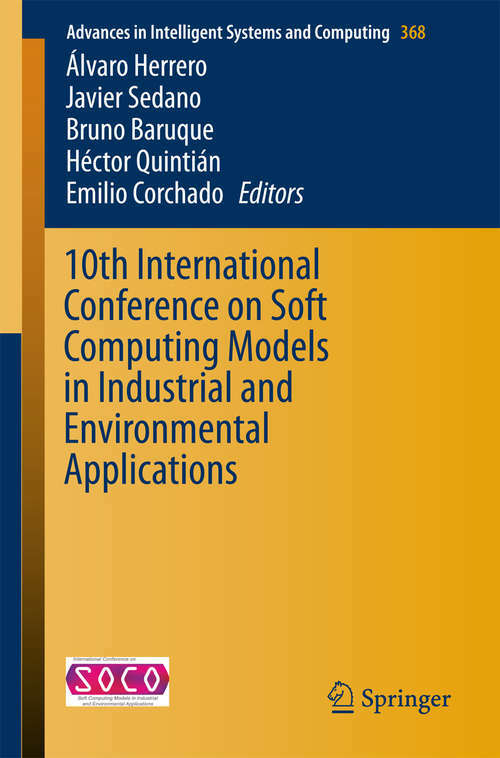 This volume of Advances in Intelligent and Soft Computing contains accepted papers presented at the 10th International Conference on Soft Computing Models in Industrial and Environmental Applications (SOCO 2015), held in the beautiful and historic city of Burgos (Spain), in June 2015. Soft computing represents a collection or set of computational techniques in machine learning, computer science and some engineering disciplines, which investigate, simulate and analyze very complex issues and phenomena. This Conference is mainly focused on its industrial and environmental applications. After a through peer-review process, the SOCO 2015 International Program Committee selected 41 papers, written by authors from 15 different countries. These papers are published in present conference proceedings, achieving an acceptance rate of 40%. The selection of papers was extremely rigorous in order to maintain the high quality of the conference and we would like to thank the members of the International Program Committees for their hard work during the review process. This is a crucial issue for creation of a high standard conference and the SOCO conference would not exist without their help.